The four of wands is a card that stands for celebration, harmony, marriage, home and community, and is one of the more happy and positive cards in the deck. It represents a time of fulfilment and satisfaction at the attainment of a goal. The layout in the artwork that I created for this card, roughly represents that of the original card. Like the original Ride Waite, there is a happy couple in the middle in unison. In this card, surrounding them are four beams that are the wands coming from an UFO, which is their “home”. In the original card, there is a large castle behind the couple and a canopy of flowers on the four wands is also similar to the wedding canopy. Instead of a large castle, on my interpretations, there is now a large planet and the flowers have been replaced with little stars. 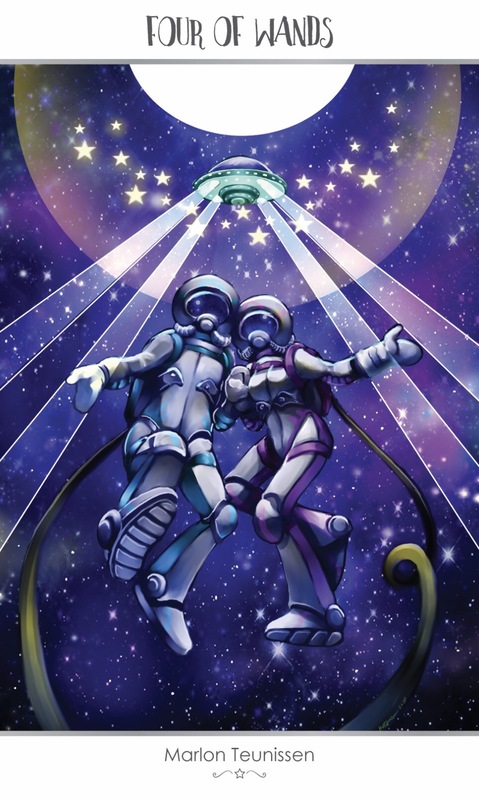 Full of warmth, two astronauts are dancing in space, illuminated by four wands of light from their spaceship. They have been hard at work but now they take a moment to celebrate the beauty around them. It takes a lot of luck and skill to get here, but they have achieved it…their determination has led them to this moment and they revel together, their arms stretched out…inviting you to join in. When this card appears in a reading, it is prompting you to celebrate your achievements. Right here, in this moment, life is good! Enjoy the moment, and appreciate those around you. Acknowledge and rejoice in how far you’ve come. What you have managed is no mean feat. There will be plenty of time later for work. For you to face and overcome the usual struggles, challenges, and problems. Life is full of those…for now, forget them all and just have some fun! This entry was posted in Artist, Deck Review, Featured Card of the Day, General Tarot, Readings and tagged 4 of Wands, 78 Tarot, Astral, Tarot.